Hurray, Laneige has launched Lip Sleeping mask and this is one of my favourite. It helps to melting dead skin cells on the lip while sleeping . 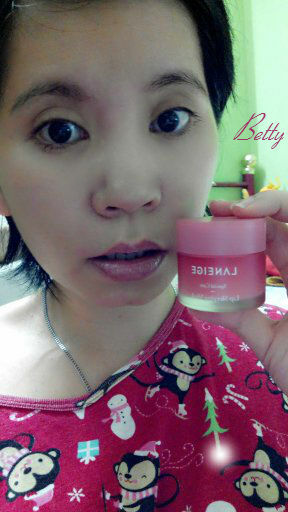 Laneige Lip Sleeping Mask help to renourish and rehydrate chapped lip. A berry mix – Content 4 types of berries provides the lips with rich vitamins and offers antioxidant effect for smooth, firm lips. It taste nice and my lip look pinkish after several application. Easy to apply as I just need to apply a thick layer of mask onto the lips and wipe off gently with tissue the next morning. After that I can apply any lip balm or lip gloss. Guess what....It comes with pink spatula to keep everything sanitary. For more information, follow them on facebook https://www.facebook.com/laneigemalaysia?fref=ts or follow Laneige's Malaysia Instagaram @Laneigemy. Laneige Lip Sleeping Mask is available at all Lainege counters nationwide and cost you RM 70 for 20g. Have anyone use this product before? You may share your experience at my post.